Do You Take Photographs or Make Them? 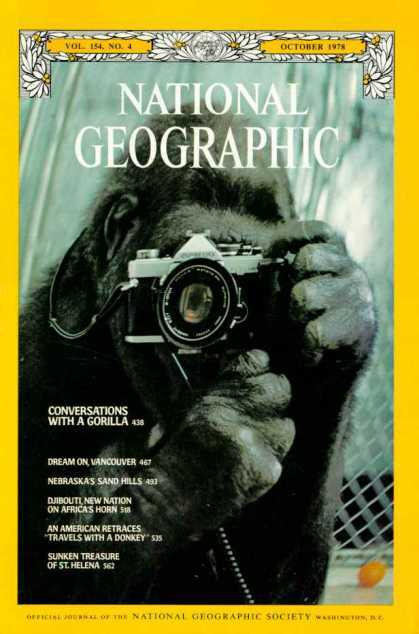 In October 1978, the cover of National Geographic showed a self portrait of a gorilla using a camera. I’m serious—you can look it up if you would like. The cover shot was a self portrait, taken by a gorilla, and by the standards of the day it was actually pretty good! “Coversations with a Gorilla,” National Geographic cover, October 1978 (via Cover Browser). Each year 100 million Americans also take some pretty good photos. OK, admittedly not all of them are that good . . . but with auto focus and extremely high mega pixels, it is fairly safe to say that more people are taking better pictures than ever before. So the obvious question is where does that leave us “serious” photographers? For those of us who know that “pretty good” is not good enough, we must push ourselves further; we must create with more artistic flair and emotional impact. The desire to move beyond the basics is what separates us from . . . the gorillas of the world. Technologically advanced cameras are now so readily available than anyone can pick one up at their local Wal-Mart just as easily as getting groceries. A great camera does not make a great photographer. Learning how to create a great photo is not as simple as one might think. There may be thousands, if not hundreds of thousands, of books and magazines that will teach you the craft of photography. But learning just the craft is like running a race with only one shoe. Photography is both an art and a craft. The craft is fairly well known; shutter speeds, f-stops, filters and the like, are an extremely important key to any photographer’s success. Of course, the craft of photography is only half the story; it’s the easy half that even a big ape could learn (yet not everyone does). Visit any National Park, go to a scenic lookout point, and just sit back and observe. Many people will drive up, jump out, shoot their picture, and zoom off again. This type of person is taking a picture. Simply put, he will take what is before him and discount all the creative possibilities, because he has what he wants. On the other hand, wait a little longer and you will see someone who leaves his car slowly. He cautiously approaches the scene with silent reverence. His eyes explore like a small child in a toy store. He may stoop down low or strain his neck to see further than his body normally allows. This person is making a photograph. His mind is open to the creative possibilities. Photo by Aftab Uzzaman; ISO 100, f/22.0, 1/60-second exposure. 1. Photograph what you like best. Photography is like a love affair; it is not to be taken lightly. You do not share your heart with every person you meet. Likewise, do not waste your passion on areas of little interest. I, for one, would never be good at aerial photography, mostly because of a fear of heights. Photo by Jonas Wagner; ISO 100, f/8.0, 1/250-second exposure. 2. Prepare yourself. Learn all that you can. Books and magazines are only part of the resources you have available. Web sites, podcasts, art galleries, and photography shows all enable you to expand your own vision. It is very hard for someone to think outside the box who has never even tried to open the lid. Give your mind something to be creative with. 3. Become one with your subject. When the opportunity arrives, let your eyes dance across the subject. Take in the highlights and shadows. The art of seeing photographically means to go beyond the surface. Take a moment; look at it from all possible angles. Whether your subject is living or not, treat it like your best friend. This is where passion comes from. 4. Think your shots through. What emotions are you feeling when you look through your viewfinder? If you can put your feelings into words, the next step is to put those words onto film (or digital media). Have an objective in mind when you go to shoot your photos and you will make fantastic creative images–not just take average snapshots. 5. Multiply the possibilities. The right subject at the right time is what great photography is all about. Shoot your subject several times from several different angles. If this is a once in a lifetime opportunity, don’t leave anything to chance. Take multiple exposures, as well. Remember, your camera always wants to average the light. If you want better than average results, push your equipment as well as your mind. 6. Take notes. A pencil is the cheapest piece of photographic equipment you can carry. If an image is a success or a failure it means nothing unless you can do it again. Don’t change too many things at one time, lest you end up still having no idea what made the image work. Document your efforts and don’t be afraid to learn from your failures as well as your successes. Making a photo is like drawing water from a well. If the well is dry, it doesn’t matter how many times the bucket goes up or down. Your job is to keep those creative juices flowing. As you fill the well with knowledge and experience, more inspiration will come to the surface. What gives you style or makes your work unique is what you bring to the surface. The more you put into it, the more you get out of it. Absolutely beautifully said / written … a wonderful insight into what we do … and what the passionate among us are feeling while we do it!! Great tips, great reminders!! Thank you!!! I’ll be sharing this one for sure!! Extremely well written and educational article. Succint and to the point. I have no issue with my photo being used but being asked first or even being informed that it had been used would have been nice. Fine advice – keep up the good work.